On my long ago first day in Second Life™ I was trying to figure out why I waddled and other females swayed when walking. It didn’t take long for me to learn about Animation Overriders, AO’s. I used ZHOA and then ZHOA II during most of my time in SL. But, there have been advances in AO tech since the ZHAO units were developed. Now we have another advance. 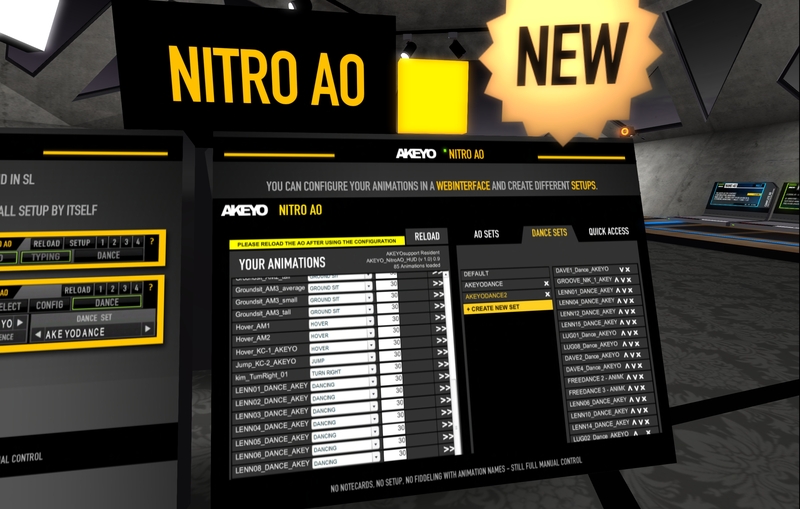 I’ll take a look at it and whether it is worth the effort to change to a newer AKEYO NITRO AO. My review follows. 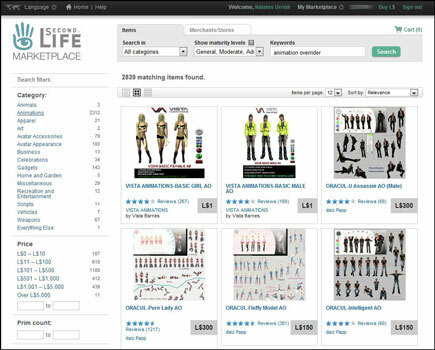 Posted in Animation, Community Tools, Second Life. Tagged AO. At the Server Beta meeting Kelly and Maestro Linden just announced the addition of two new Linden Scripting Language (LSL) functions that will allow script-less Animation Overriding (AO). llSetAnimationOverride(“Walking”, “sassywalk”) – where Walking = default animation state and sassywalk = the animation to use for that state. llGetAnimationOverride(string anim_state) – Get the name of the animation currently set for state. Posted in Scripting, Second Life. Tagged AO. From a couple of sources we have bits and pieces that suggest the Lab is looking to provide a built in viewer feature for handling avatar animation. Currently we use animation overriders (AO) to override the built-in avatar animations. Most of those are a HUD of some type. Discussion is in progress to determine what AO feature set is needed for the Lab’s viewer. Since AO’s are basically free (only the animations cost) the user’s choice of which one to use is entirely based on features and personal preferences. Free market principals allow the best to become the most popular. Concern is voiced by some that a built-in replacement for AO’s by the Lab may limit our freedom of choice. However such limiting would break a considerable amount of existing content. Breaking all the existing AO’s, or any content, is something the Lab is loath to do. So, I can’t image the Lab will take that path. Whatever they do, will allow users to still use their AO’s. Posted in Changes, Second Life. Tagged Animation, AO.